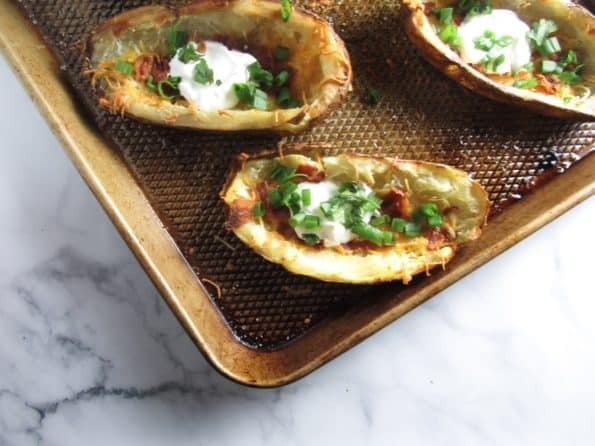 Make these beloved Loaded Potato Skins for an easy & classically American appetizer, perfect for game day that will compete with any frozen version! I love being able to remake things at home that you normally only get as a restaurant appetizer or in the frozen food aisle. (I’m looking at you TGI Friday’s frozen potato skins). I know I’m not the only one who used to be obsessed with frozen everything. I grew up in the 90s, so…hello Ellio’s pizza, Hot Pockets, Toaster Strudels, Bagel Bites, & French Toast Sticks. I can keep going, but the word we’re looking for here is processed. My brother and I used to eat any of the above on a given day. I actually still can’t walk down the frozen foods aisle like a normal human being (aka, without feeling like an addict in memory lane). It wasn’t until I started cooking for myself on my own that I really became interested in learning how to cook from scratch. What I once used as “premixed”, “canned/preserved”, or “frozen” I realized could all be made from real whole ingredients. This opened up a whole new world to me where I realized the shortcuts were really not serving me well. The major reason behind this has been because I’ve always been sensitive to MSG which can be found under 57 names! FIFTY-SEVEN!! Any of which are found in frozen and processed foods. Some snacks are really easy to replace and make at home – and actually come out BETTER than their processed versions. 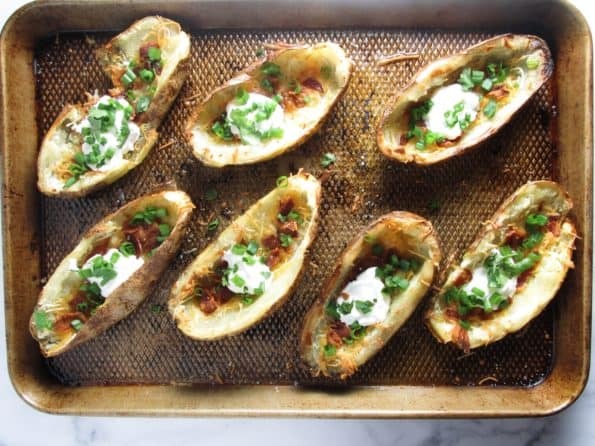 These Loaded Potato Skins hardly take any effort – yet are so rewarding because they’re comfort food classics. The only part to mess up is making sure you have enough! Although these feel extremely greasy and heavy – they’re surprisingly healthy and lower calorie. Since were scraping out the majority of the flesh from the potato, the carbs and calories cut way down. However, all the vitamins of potatoes are in the skin, so we’re leaving only the most nutritious part. Top with some cheese, veggies, sour cream, cilantro, and of course, bacon. Start by rubbing down russet potatoes with a little bit of vegetable oil and coarse flaky sea salt. Next, bake them in the oven at 375 for an hour. Take them out of the oven and let them cool. Slice them open and if the flesh is still hot, let them cool off. Learn from my mistake of burning your fingers and allow these time to cool fully before starting to scrape them out. Take a spoon and scrape out the middle of each half, only leaving a thin layer of the potato remaining. 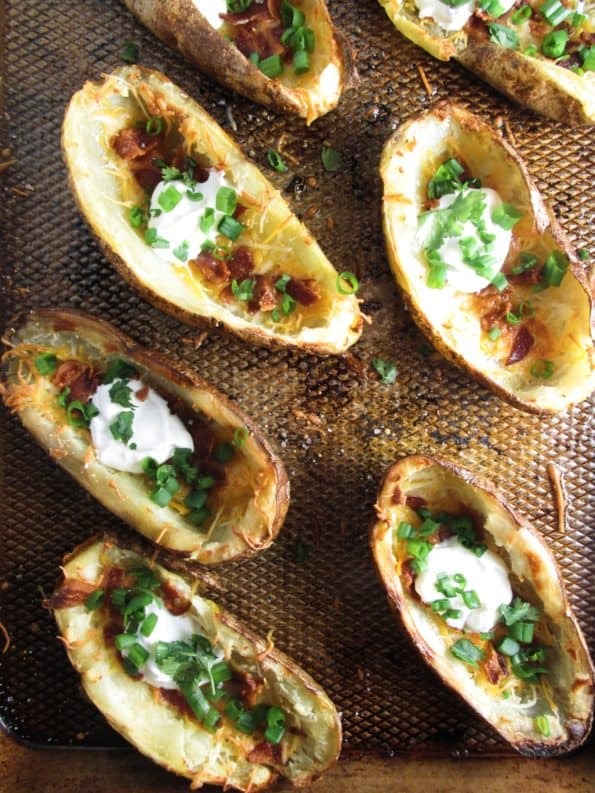 Top the insides with sharp cheddar cheese and a spoonful of bacon. Place back in the oven on broil to let the cheese melt and everything brown a little, about 4 minutes. Once they come back out of the oven, top with sliced scallion, cilantro, & sour cream, or whatever else your heart desires! Preheat the oven to 375. Start by rubbing down the russet potatoes with the vegetable oil and coarse flaky sea salt. Next, bake them in the oven for an hour. Take them out of the oven and let them cool. Slice open and if the flesh is still hot, let them cool off. Learn from my mistake of burning your fingers and allow time to cool fully before starting to scrape them out. 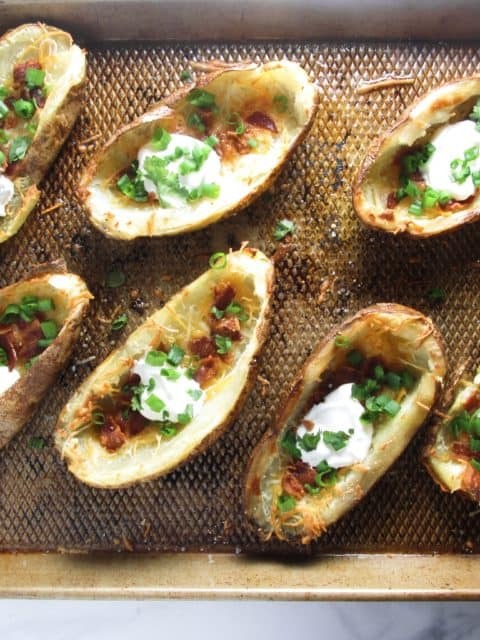 Once they come back out of the oven, top with sliced scallion & sour cream, or whatever else your heart desires!